A good skin care regimen starts with a good practice of cleansing, and a face wash is, indeed, an integral part of it. The market is flooded with a surprisingly wide variety of face washes and you are free to choose the best one from them based on the type and requirements of your skin. But, picking the right face wash from such huge collections is really tough. If you are not sure whether a creamy face wash with rich foam is a good choice for you or a gel-based face wash with tiny exfoliating beads is what your skin need, you will end up damaging your skin in no time. Well, let us help you out. Here, we have listed 7 best face washes available in India that you can try without worry to get a clean and bright skin. Before we move on to see the best face washes available in India, remember that finding the perfect face wash for your skin is a matter of trial and error. Always pick the smallest of the pack sizes to do a trial on how your skin responds to it. Do not wash your face more than twice a day with a face wash. Now, let’s check the best face washes available in India. 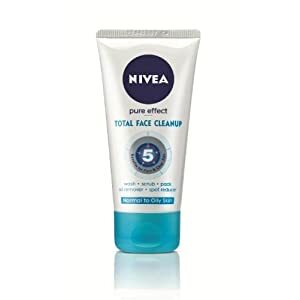 The Nivea Pure Effect Total Face Clean Up is an exclusive 5-in-1 face wash meant for normal to oily skin. It combines the effects of ‘Wash’, ‘Scrub”, ‘Pack‘, ‘Oil Remover‘, and ‘Spot Reducer‘ to give you 5 benefits of pure and clear skin in just 5 minutes! Enriched with active magnolia extracts, this product cleanses the skin deeply by unclogging the pores. It not only removes the dirt, blackheads, and excess sebum trapped in the pores but the anti-bacterial formula also fights any skin irritation or allergies. Price: Rs. 120 for 50 ml. 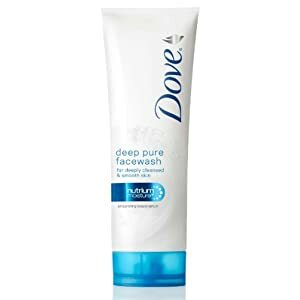 The Dove Deep Pure Facewash is more of a nourishing beauty serum that provides all the moisture to your skin while making it squeaky clean. It is made of millions of gentle micropuffs (up to 10X smaller than regular microbeads), which eliminate dirt and excess sebum from deep within pores effectively. Conversely, its creamy foam comes enriched with unique NutriumMoistureâ„¢ for moisturizing as well as nourishing the skin intensely to leave it soft and smooth. Needless to say, it is the perfect daily facewash for all skin types. Price: Rs. 100 for 200 ml. The Himalaya Herbals Purifying Neem Face Wash is one of the most popular facewashes that helps prevent acne and pimples in all skin types. It is a soap-free, herbal formulation that combines the goodness of neem and turmeric for cleansing the skin from within without drying it out. The antibacterial properties of neem combat bacterial infections to prevent the recurrence of breakouts while the anti-inflammatory and antiseptic qualities of turmeric heal and soothe the skin. Apart from removing impurities, the face wash also improves the elasticity of the skin and evens out its tone. Price: Rs. 117 for 100 ml. The Body Shop Tea Tree Skin Clearing Facial Wash is suitable for oily, blemished, or acne-prone skin. Being infused with potent organic tea tree essential oil (collected from the foothills of Mount Kenya), the product fights against skin infections efficiently by unclogging skin pores of all the accumulated sebum and dirt. It makes the skin free from excess oil and shine without drying it out. Rather, its moisture-balancing properties help keep the skin soft and enough hydrated. The cooling lather generated by this daily facial wash purifies the skin and makes it visibly clearer while giving us a refreshed feeling. Price: Rs. 645 for 250 ml. The Pond’s Pure White Deep Cleansing Foam contains activated charcoal to provide you much more than just regular ‘cleanliness’. It absorbs easily into the skin, penetrates deep into the cells, and draws out the black impurities as well as pollution particles present inside the pores. As a result, you get a flawless skin that is free of breakouts and blemishes. It also exfoliates the skin to remove the layers of dead cells from its surface, thereby revealing the naturally glowing and bright skin underneath. Being rich in vitamin B3 and glycerin, it nourishes the skin well instead of leaving it dry. The gentle product is perfect for daily facial cleansing and is suitable for all skin types. Price: Rs. 175 for 100 g.
The Lakme Youth Infinity Skin Firming Facial Foam is a ‘first-of-its-kind sculpting facial foam’ from the highly popular Youth Infinity range by Lakme. The cleansing liquid transforms into a light, rich foam that helps remove deep-seated impurities without drying the skin while its unique skin-firming formula helps makes the facial skin look fresher, softer, and more youthful. This daily deep action treatment is perfectly suitable for women, who want to transform their aging skin completely by preserving its tautness, thereby getting the sculpted looks of their 20’s back. It not only induces enough hydration in the skin to make it firmer and more elastic but also prepares it for the maximum absorption of other active skincare ingredients. Price: Rs. 525 for 130 ml. The Lotus Herbals Whiteglow 3-In-1 Deep Cleansing Skin Whitening Facial Foam is a chemical-free, 100% herbal product that promises a clean, radiant, and absolutely flawless look for all types of skin. Packed with the natural goodness of aloe vera, milk enzymes, and minerals, this product helps in deep cleansing the skin, blocking excessive melanin production in it, and making it brighter over time. MIlk enzymes and minerals nourish the skin and aloe vera takes care of its overall health. It penetrates deep into the skin to lift away impurities and excess sebum while eliminating the accumulated dead cells from its surface effectively. These are essential to keep breakouts, blemishes, suntan, and hyperpigmentation away. Price: Rs. 215 for 100 ml.